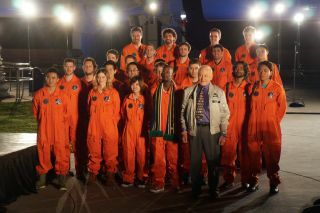 The 23 future Lynx travelers pose with moonwalker Buzz Aldrin after they were announced the winners of the AXE Apollo Space Academy. Image uploaded Dec. 5, 2013. CAPE CANAVERAL, Fla. — Twenty-three people are now the proud recipients of free trips to space and back again. For the past week, more than 100 participants from over 60 countries around the world have taken part in mental aptitude tests, combat training in a fighter jet and zero-gravity flights to distinguish themselves as the most worthy of one for one of the coveted tickets to space with Space Expedition Corporation under a project by the makers of Axe Apollo body spray. SXC manages trips aboard the reusable XCOR Aerospace Lynx spacecraft, a commercial space plane that is expected to begin flying customers in 2014 or 2015. "It has been a long journey and to finally have it end up like this is so rewarding," Patrick Carney, the United States ticket winner told SPACE.com. "It's unbelievable. I'm so excited … Looking down on Earth is definitely going to be the coolest part. That's what all the astronauts say. They say that when you actually look down you can see how beautiful the Earth is. That's when you really understand humanity. That's exactly what I'm looking forward to the best." Patrick Carney won a free ticket to ride the Lynx space plane when it begins taking customers to the edge of space. Two women and 20 more men from 21 different countries — including Canada, South Africa, Thailand and China — also won tickets to fly aboard Lynx. Four women competed in the space academy alongside 105 men.The complete list of winners will be released soon, Axe Apollo Space Academy officials said. "With my generation, only the few could go up into the heavens," former NASA astronaut and second man on the moon Buzz Aldrin told the crowd at the AXE awards ceremony. "When I took my first step on the moon I never could have guessed that space travel would evolve the way it has. Going into space has been the biggest privilege of my life … More of you will see space in the next few years than at any other time in history." While recruits from some countries were in direct competition with one another, other nations had different metrics for choosing their winner. For example, Carney was chosen thanks to a random drawing. A participant from the United States was guaranteed one of the 23 tickets, Carney was chosen. Jake Rohrig from Illinois, Bill Bell from West Virginia, Jose Cook from North Carolina, Corey Fraser from Texas, Robert Katz from New Jersey, Johnnie Moore from Hawaii and Stephen Spencer from Florida were also competing for the United States ticket. Aldrin was the chairman of the judging committee that ultimately decided many of the winners. Awarding the tickets to space was about more than finding the most impressive people to fly on Lynx; it was about the future of spaceflight. "We want them to be enthusiastic," Aldrin told SPACE.com of the winners. "We want them to know how the space program has evolved, what its future may be … They have the nucleus of role models that are enthusiastic about space, who are looking for other opportunities to be a part of what is growing. "That's the big output of this," Aldrin added. "This [Lynx] could evolve into something in several years, which may be able to get people into orbit. We're looking for the bravery, the heroism, the working together with people and I'm just happy to be an ambassador who has exhibited a lot of interest in the future."